One of the manufacturing processes in which Safran Additive Manufacturing is more specifically interested in, is the Laser Beam Melting (LBM) process. The simulation of this process aims at identifying issues associated with part distortion during the manufacturing process, as well as the potential risks of failure of the part and its supporting structure. Safran called on MSC Software, which offers a solution that uniquely covers the entire manufacturing process, from the initial melting step of the part to the completion of a final HIP treatment (Hot Isostatic Pressing), including all post-processing operations such as a stress-relaxation heat treatment, baseplate cutting and supports removal. This solution is Simufact Additive. Safran Additive Manufacturing has taken full advantage of the added value of the Simufact Additive solution in order to secure the integration of the additive manufacturing processes into its “product-process” development processes, both upstream during product design and downstream for the production launch. Safran Additive Manufacturing is now focusing on extending the use of the Simufact Additive solution to different types of parts and different grades of material, in order to improve the design process for additive manufacturing as a whole. MSC Software supports Safran Additive Manufacturing and the Group in achieving this objective through this solution that integrates into the global additive manufacturing value chain, ensuring a quality and open digital continuity. The use of Simufact Additive has enabled us to save considerable time in production preparation thanks to the predictive nature of the software, which limits development by manufacturing iterations by using virtual development upstream, but also during the part design phase, by enabling us to anticipate the effects and limitations of the process at the product design level. One of the added values of the Simufact Additive solution is that it allows us to bring together two activities: engineering and production. On the one hand, people from engineering who design parts with a strong focus on part performance in service, and, on the other hand, the methods office who master the industrial processes and its associated constraints. Simufact Additive is a solution well adapted to simultaneous engineering that facilitates dialogue between the different business activities involved in the same project. In addition, the software is easy to use, with an intuitive, business-oriented interface that allows for quick and easy appropriation/ownership. At moderate to high speeds, the only external noises typically generated by electric vehicles are caused by wind resistance or tire noise. As a consequence, electric vehicles present a risk to pedestrians and cyclists, especially those who are visually or hearing impaired or listening to headphones. Hyundai active pedestrian alerting system Regulations have been issued in both the United States and the European Union requiring that newly manufactured electric vehicles make an audible noise when traveling at low speeds. These regulations have differing requirements for the amplitude and frequency content of the warning sound. The simulation results were validated by conducting a 1-volt sine sweep test for both the actual speaker and the simulations. As shown in the figure above, the spectral behavior of sound at 1 meter from the speaker predicted by simulation matches the physical measurements nearly perfectly. By using Actran to optimize cavity and duct resonances, Hyundai engineers were able to design the speaker to handle low, mid and high frequencies as needed to meet both US and EU regulations while at the same time minimizing speaker size and power consumption. “The simulation results provided by Actran were much more comprehensive than information generated by physical testing, which helped Hyundai engineers quickly iterate to an optimized design in about half the time that would have been required using traditional build and test methods,” Lee said. While Sheet Molded Compound (SMC) materials have been widely used in the automotive industry for some time, recently there has been a move to apply SMCs on more structurally demanding components. 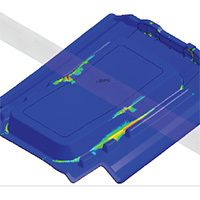 Though the material has long been considered quasi-isotropic with relative success, it has become apparent in industry that due to the complex manufacturing process, optimal structural design is not possible without considering the real anisotropic nature of the material.. With growing demand from the market, now is the time to leverage advanced SMC modeling capabilities targeting crash performance. Static and crash FEA simulations can now attain an excellent level of accuracy in stiffness and can capture peak load and displacement trends for typical part load cases. The inner seat part illustrates the proposed workflow from process simulation to structural application. The Digimat simulation achieves a much better fit with respect to test data for most load cases, including head impact (puncture) and provide a good indication of hot spot localizations. Avoid additive manufacturing issues (distortion, residual stress) and establish a “right first time” manufacturing process. Build process simulation helped Bosch to predict manufacturing issues and to find the right countermeasures to optimize the AM build process. 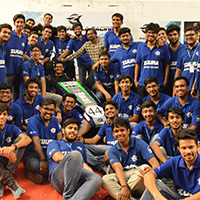 Zuura Formula Racing is a student team from the Vellore Institute of Technology in Chennai, India that participates regularly in the Formula SAE student competition organized across the globe by SAE Interna-tional. For participating teams, the task at hand is to develop a small formula-style race car. Each student team designs, builds and tests a prototype based on a series of rules, aimed at ensuring on-track safety and promoting clever problem solving. The prototype is evaluated for its potential as a production item. During the course of this project, one of the focus areas for the Zuura Formula Racing team was to ensure good suspension for their vehicle. To achieve this, they needed to ensure that the tires were as perpendicu-lar to the ground as possible to achieve maximum traction. The front geometry had to be designed such that it had a negative camber in jounce. This was an important factor in keeping the wheels perpendicular to the ground, and also to resist body roll. The main target before the vehicle dynamics simulation engineer at Zuura Formula Racing was to improve the ride and handling of the vehicle by reducing yaw, pitch and roll rates. The Zuura Formula Racing team used the Adams Car software from MSC Software. Adams Car allows students to design and simulate their FSAE vehicles to maximize their vehicle performance. With Adams Car, FSAE teams can quickly build and test their functional virtual prototypes of complete vehicles and vehicle subsystems. FSAE engineering teams can exercise their vehicle designs under various road condi-tions, performing the same tests they normally run in a test lab or on a test track, but in a fraction of time. Swiss startup, WayRay is best known for developing the first-ever holographic AR navigation system for cars. Dr. Maksim Aleksandrov, CAE Engineer at WayRay, sheds light on how the R&D team has applied scSTREAM to the development of the holographic navigation cooling system. In the future the WayRay team plan to incorporate a more complete picture of structural loads, expansion and stresses by exporting temperature variations to strength & structural analysis tools. They also plan to conduct thermal calculations of optical systems as well, given that the MSC Cradle CFD system can take into account lens reflection and refraction due to heat radiation. "We also plan to conduct thermal calculations of optical systems as well, given that the MSC Cradle CFDsystem can take into account lens reflection and refraction due to heat radiation. Aerodynamic noise analysis is our other challenge," - (Mr. Maksim Aleksandrov). WayRay chose scSTREAM for thermo-fluid simulation because of its high operability, accuracy and comprehensible GUI. WayRay engineers are satisfied with the capability of scSTREAM and eager to continue to apply the CFD tools to produce excellent computational results and achieve more effective development. "The CFD analysis from MSC Cradle enables WayRay to shorten the design and prototyping process, allowing engineers to visualize and simulate design variations previously unavailable for physical measurement and evaluation," - (Mr. Maksim Aleksandrov). The medical industry is moving in a direction towards robotics to help patients in the rehabilitation process. Gait training (over ground or on a treadmill) has become an essential part of rehabilitation therapy in patients suffering from gait impairment caused by disorders such as stroke, spinal cord injury, and multiple sclerosis. A focus on the human in collaboration with a robot puts emphasis on the adaptability, safety, and task specificity of robotic assistance. Hence, in the development of novel rehabilitation prototypes engineers face the challenge of combining suitable design concepts, high performance actuator technologies, and dedicated control strategies in view of improved physical human-robot interaction (HRI). The improvements should lead to a better insight into effectiveness of robot-assisted rehabilitation and ultimately, lead to therapies that are more effective. One of the approaches to facilitate the design process, in terms of development time, functional and safety evaluation, is using computational multibody simulations. Nowadays, multibody modeling and simulations are recognizable as an efficient and relative inexpensive evaluation approach. Due to the continuously increasing complexity of the wearable robots, almost any study conducted in the field of robotics can profit from a simulation of the system behavior, foregoing experiments on a real platform. Moreover, an advantage of using multibody modeling represented by the possibility to predict various outputs that are difficult, dangerous, or even impossible to reproduce in the real experimental setup. The 3D model of a novel CORBYS rehabilitation device has been developed and co-simulated with the human body using object-oriented multibody dynamics software, Adams. Adams gave researchers the additional insight they needed on the push-pull actuation system. The simulation results show that the transmission efficiency of the PPC is dependent on nonlinear friction between the tendon and the sheath. While the friction was influenced by an attached load to the cable and the curvature of the PPC. The simulation results had an impact in defining the actuation system parameters and appropriate control implementation design. These insights helped them present a working concept, which will open doors for further exploration for research and development. 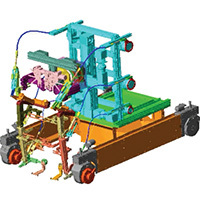 According to modeling experience in Adams, the team confirm that multibody simulation tools are very effective in cases when the main design, technical, and functional characteristics of the real system are accurately reproduced in computational model. In order to obtain a useful functional model, users need a good understanding of the governing mechanics describing a physical system to make relevant choices between numerous simulation platforms. In designing heavy machinery, such as those on cranes or oil rigs, small plastic components or rubber seals can be vital to the integrity of those large structures. Stephen Armstrong an FEA Analyst/New Product Development Engineer and his team at Parker Hannifin Corporation work on designing just these types of parts. Parker Hannifin is a trusted leader in motion and control technologies. Stephen’s team’s main area of focus is on seals that are comprised of hyperelastic materials such as rubber, polyurethane, and other compounds. These seals are used in a variety of applications in heavy machinery, medical devices, military and aerospace industries. Engineers working with these materials focus on nonlinear analysis in most of their projects, because these materials mainly exhibit non-linear behavior. MSC’s Marc was their tool of choice for simulating such behaviors. 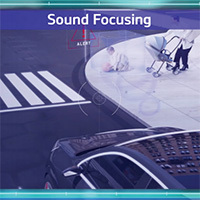 In recent years, there has been a global initiative to reduce traffic noise and improve comfort in automotive vehicles. Engineers have to meet stringent government regulations while still improving the passengers’ experience. One requirement involves a measurement procedure commonly referred to as Pass-by Noise. The maximum allowed sound level for Pass-by Noise has recently been reduced, now representing a new constraint on the design of commercial vehicles. Countermeasures to reduce noise emissions consist in moderating the different acoustic sources by either acting on the noise generating mechanisms or managing the noise propagation. Adding sound absorbing materials or modifying parts of the vehicle geometry are solutions that engineers are investigating to solve this problem. With its wide range of vehicles, the Renault team has to anticipate the evolution of Pass-by noise regulations and design vehicles according to future constraints. 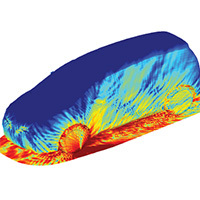 Renault decided to extend its acoustic simulation capabilities and model the exterior acoustic propagation using Actran, a product of FFT, an MSC Software Company. With Actran, Renault was able to improve their designs and reduce development costs by considering the vehicle acoustics early in the design phase. When studying Pass-by noise, it is essential to make sure that the numerical simulation is accurate. The absolute sound level recorded during the test determines if the vehicle will pass or if it will be rejected. “We had some measurements from physical testing available when we started the validation,” Philippe explains. “When we started the project we were quite far, we needed to analyze the results and understand the problems in the way we were modelling. Now we are quite happy with the results. 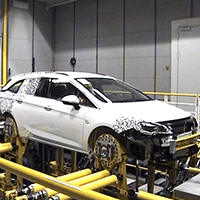 We went quite fast in improving the accuracy.” Following this successful validation phase, the methodology is now used daily by Renault engineers to optimize the technical definition of the vehicle to be sure that absorbing materials will be placed exactly where needed. “Compared to the initial target, we achieved much better performances. We started from scratch for this exterior acoustic problem, and what we were able to achieve in just a couple of years in this project is quite impressive to me” concludes Philippe. 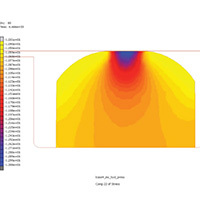 Reducing development costs by integrating acoustic constraints at early stages through simulation. For more than 25 years, Stratasys has been a defining force and dominant player in additive manufacturing – notably inventing the Fused Deposition Modeling (FDM) Technology. The company’s solutions provide customers with unmatched design freedom and manufacturing flexibility – reducing time-to-market and lowering development and manufacturing costs. FDM® (fused deposition modeling) is becoming the technology of choice for rapid production of high-temperature (> 177 ° C), low-volume, composite lay-up and repair tools, as well as for moderate-temperature (<163 °C) production sacrificial tooling. Relative to traditional tooling materials and methods, FDM offers significant advantages in terms of lead time, tool cost and simplification of tool design, fabrication and use, while enabling increased functionality and geometric complexity. Print it right the first time! Minimize warpage in only two steps! Access to an easy, efficient and user-friendly GUI! MSC Software pioneered many of the technologies that are now relied upon by the Aerospace industry to analyze and predict stress and strain, vibration & dynamics, acoustics, and thermal analysis in their flagship product, MSC Nastran. Similarly, MSC Marc and MSC Adams are highly regarded as industry-leading applications for non-linear simulation and kinematics, respectively. TEN TECH LLC, a Los Angeles based engineering consulting firm, conducts complex engineering Finite Element Analysis. As subject matter experts in shock, vibration and thermal analysis for the Aerospace & Defense Industry, TEN TECH LLC relies heavily on MSC solutions. The types of products and applications TEN TECH is involved with share a common characteristic: field failure is never an option. To validate these designs, complex multi-physics analyses and high-performance solvers that provide great accuracy are required. TEN TECH LLC being a Small Business, high-end CAE software procurement is always a delicate balancing act as high performance and accuracy comes at a hefty premium. At least it did until now: enter MSC One. MSC One is an expanded products token system that allows companies to take advantage of the breadth and depth of MSC Software’s simulation portfolio within a flexible token-based licensing system. Offered on an annual subscription basis, MSC One provides efficient implementation and access to a suite of multidisciplinary engineering software tools. For TEN TECH LLC, the ability to easily access the extensive MSC One product portfolio, including all of MSC’s core products such as MSC Nastran, Adams and Marc, but also Sinda and SC/Tetra for thermal and CFD analysis was an easy choice. Access to such a variety of tools through a “check-in, check-out” token system, allows the team at TEN TECH to solve a multitude of their clients’ vibration, non-linear, thermal and CFD problems for a fraction of the cost typically incurred. 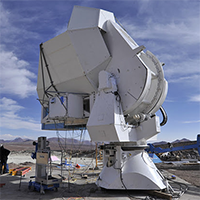 Recently, TEN TECH LLC’s Structural Mechanics Group has been actively involved in the development of telescope structures, providing Finite Element Analysis expertise for the design validation of the telescope structure supporting the Polarization of Background Radiation telescope array experiment (POLARBEAR-2). Funded by the Simons Foundation, POLARBEAR-2 is an international collaborative effort including 8 countries, and 20 institutions. 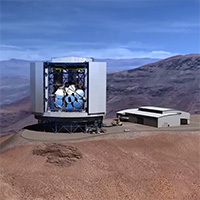 Based in Chile’s Atacama Desert, the Simons Array, comprised of three polarization of background radiation telescopes, will probe the skies in search of proof of inflation, the hypothetical moment following the Big Bang. “We heavily relied on MSC Apex and MSC Nastran to perform these complex structural analysis tasks. MSC One made our life much easier than with our traditional workflow” - William Villers, CTO & Director of Engineering at TEN TECH LLC. The TEN TECH team was able to quickly mesh and run FEA on a very large and detailed model of a complex assembly, starting from native CAD files. Apex allowed the team to proceed with incremental analyses of subassemblies and build a very large and complex model “right the first time”. With Apex, the engineers shortened their “CAD to FEM to Analysis” time by 25%-30% compared to their traditional workflow process. At the same time, they delivered a high fidelity, reliable model to their client. 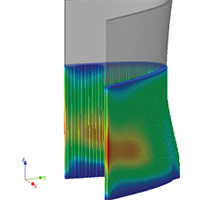 MSC Nastran’s high performance was highlighted throughout the entire project: through its ultra-fast iterative solver and GPU-accelerated processing for linear statics, to Automated Component Modal Synthesis (ACMS) and Distributed Memory Parallel (DMP) solver for large dynamics problems, MSC Nastran performed flawlessly and delivered the highly accurate results required to achieve the proper confidence level in the design. TEN TECH plans to further utilize MSC’s products through MSC One, including Sinda, Adams, and MSC Nastran. The price of MSC One gives the TEN TECH team the financial freedom they need to use MSC Nastran and other products. Having a pleasant driving experience is a key determinant when purchasing or driving a vehicle. For companies buying trucks and for truck drivers, it is also a matter of health and productivity. Most drivers spend more than 8 hours a day in the truck cabin. High noise levels or unpleasant sounds in a working environment are known to cause excessive fatigue and health problems. It is therefore crucial for truck manufacturers to carefully design their new products and shape the cabin noise to go beyond the requirements of their customers, and propose the most enjoyable driving experience possible. With a wide range of premium trucks, Scania, one of the world’s leading truck manufacturers naturally aims at designing trucks with outstanding comfort and performance. Scania’s Complete Vehicle Acoustic Department is focused on getting their vehicles up to speed with today’s drivers’ expectations by addressing the level and quality of cabin noise in their vehicles. The development for more optimized cabins is supported by extensive testing and the introduction of new methods based on vibro-acoustic simulations. For this endeavor, Scania’s development team chose to use Actran, a product of FFT, an MSC Software Company, to improve their designs and shorten their design cycles. Scania aims to increasingly utilize Actran’s simulations results to compare different designs and define the design directions early in the product development cycle, without the need for physical testing. To support this decision-making process, a listening studio was built at Scania. The studio is similar to that of a professional mixing studio. It encompasses a 7.1 surround system for sound and is designed to produce exactly the same listening experience for anyone who is seated in the center of the room. During subjective evaluation sessions, Per-Olof conveys to his fellow colleagues his findings based on his simulations. He combines test and simulation data to replicate the environment of driving an actual truck. This process helps managers to make important decisions, which will affect the design of the cabin. “It is a very different response from management when you can play a sound and they can have this subjective experience,” Per-Olof said. “It’s not really possible to understand from a graph what you will hear in the truck,” he explained. With the use of Actran in this new simulation process and the subjective evaluations allowed by the listening studio, Scania now has all the tools needed to improve its customer driving experience even further, while having a more efficient design process.